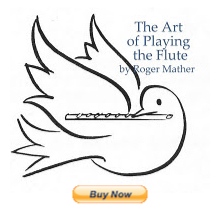 Robert Bigio has done one of many hugely marvellous things in the flute world, most recently by putting up marvellous free recordings to listen to, of some of the world's greatest flute players. These flute legends live again through re-recording the old LPs and giving some background information on each flutist. Sheetmusic pdf (free)- see second mvmt. My favorite is the recording of Gareth Morris who show how beautiful and expressive the flute tone can be will minimal vibrato. Thanks for pointing that out, Jerry. It's wonderful to hear these old recordings. Sends a chill up my spine. Thanks, Jen! It's taken YEARS to even begin to find these recordings and now, Ta Da, they are spine-tinglingly available. Fabulouso for sure!